Welcome to San Pasqual’s Kitchen! I’m Tammy Renea. In August of 2013, my husband and I went to visit my husband’s uncle in Santa Fe, New Mexico. On one of our outings we traveled to the Sanctuario de Chimayo. It was a lovely church in the valley of the Sangre de Christo Mountains north of Santa Fe. After going through the sanctuary, we walked into the anteroom where an entire wall was covered with pictures of soldiers, sailors, airmen and marines. Many of the pictures were accompanied by hand written prayers for safety and protection. At this time, both of my sons were at war in Afghanistan. I was moved by all the pictures and could imagine the hands of mothers, fathers, brothers and sisters that might have written out those prayers. I added mine to theirs and a connection to this place began. We walked over to the Potrero Trading Post. This family store sold the much coveted chiles of New Mexico, and I had to have some of this precious spice to take home with me. As the owner’s daughter was telling us some of their history, I noticed all the retablos of a Franciscan monk in a kitchen. I was told he was San Pasqual, the patron saint of cooks and kitchens. San Pasqual has been attributed as saying, “I joyfully celebrate the food I’m given. 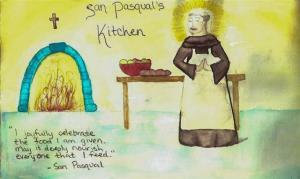 May it deeply nourish everyone that I feed.” That’s when the inspiration hit me, San Pasqual’s Kitchen. I had been thinking for some time about starting a food blog and this little quote served as my inspiration. It sums up my passion for food (a joyful celebration of it!) and the nourishing qualities I sought when preparing it. It is my hope that this blog will become a meeting place like most kitchens are. A place to meet and talk about food and life and our navigation through both. Welcome to San Pasqual’s Kitchen! I’m glad you’re here. I, too, discovered San Pasqual in New Mexico. I got a lovely hand carved cutting board with his image on it while I was there that is in my kitchen now. Wonderful inspiration for your food blog. I look forward to reading more! I agree, Victoria. I hope you can visit Santa Fe someday. It far surpassed my expectations and I can’t wait to go back. Chimayo is one of those places that I know will always be with me. My wife grew up on San Pasqual in Pasadena. About ten years ago we had lunch at Cafe Pasqual’s in Santa Fe and bought a beautiful poster titled “San Pasqual…Patron Saint of the Kitchen.” We hadn’t known about the eponym for her street until then. The small poster (a watercolor of a rustic kitchen by an artist named Kry) has made our happy kitchen even more so ever since. We tried the recipe for braised lamb shoulder chops last night and they were great! Thank you for your friendly and informative meeting place. Thank you so much for your comment! I have a little retablo of San Pasqual in my kitchen that I just love. A little note that came with it when I bought it said, “[San Pasqual] is the patron saint of cooks, kitchens, and CHEERFULNESS! So it is proving so. 🙂 I’m so glad you enjoyed the lamb shoulder chops. It is one of our favorites. Rather recently, cooking has become a bit of a challenge for me due to several food sensitivity issues, so I look forward to exploring your recipes. God bless. Why thank you!! I also will be visiting your site frequently. It’s always nice to meet a another sister in Christ. God bless! Tammy, come teach me how to cook! Tammy– I was just able to check out your blog. I am Sooo impressed. You recipes look wonderful to prepare and your photography is stunning. You have given me inspiration to experiment more in my kitchen and cook more from the soul. I’ve enjoyed reading your story and love how you connect it to your recipes. Thanks for sharing! I hope you are enjoying your hair. I found you through a search for lentil soup! I lived nearly 40 years in Spain and now live in Santa Fe,NM. Can’t write more because I HAVE to go and look at more of your recipes!! Thank you, Francesca. I use extra virgin olive oil, and I’d say I use about 3 tablespoons, however much is necessary to saute the onion. I hope that helps!